Today, we are excited to announce that we will be jump-starting a new initiative to share weekly updates on Paxos activity in an effort to bring more transparency into this space. 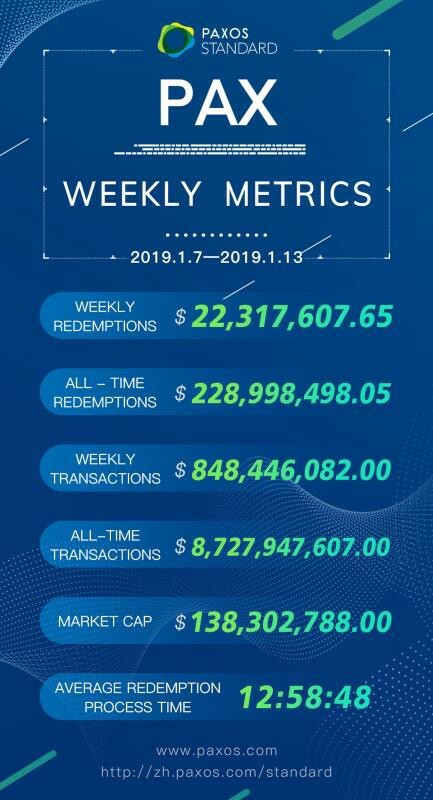 We believe the power of stablecoin lies in its ability to facilitate transactions, so we aim to share with the community our redemption volume and processing time weekly from this week on. PAX’s burgeoning partner ecosystem has played a major role in its global growth while the diversity of the types of partners is an indicator of the breadth of appeal that its stablecoin offers. Additionally, PAX has been listed as a base pair on Binance, and the trading platform, Bittrex, launched the first USD/PAX pair. Recent partnerships with Switcheo, KaiserEx, and a host of soon-to-be-launched exchanges continue to expand the geographic footprint of PAX users. On the heels of its integration with Changelly, wallets like FreeWallet and AtomicWallet have found increased value in offering PAX to their user base. With interest in the lending/borrowing space heating up, ETHLend announced its partnership with PAX, which is in addition to the stablecoin’s integration with lending platform, NEXO.io. As PAX continues to add new and innovative partners, follow along for further updates, milestones, and key metrics. All weekly updates will be published at twitter.com/paxosstandard. Originally published at www.paxos.com on January 16, 2019.